This bridge, was built in 1955 to cross the Verdigris River, was raised to its present height in 1970 after the river was transformed into the Kerr-McClellan Navigation Channel. This bridge was originally built by Lyle Buckner, Inc. In the picture above is an overview of all three spans. In the background the piers for the westbound bridge can be seen. OK 51 has been four-laned recently, so the truss bridge now carries eastbound traffic only. Below is a close view of the main span. The main span is 210' long, same as the new span behind it. The pony trusses are 100' long each. There are three pony trusses on the west end, and two on the east. 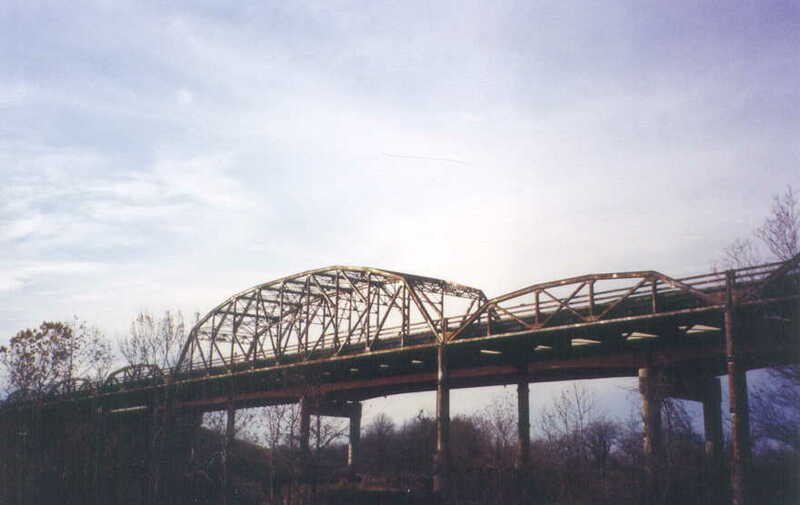 All spans are standard designs seen throughout the state. To make the bridge the required height, bolted steel piers stand on concrete piers that are as tall as conventional piers. The concrete portions of the piers are not old ones form the previous pre-waterway crossing. The original alignment for OK 51, where this bridge would have been when new, is just south of this bridge.